How do I efficiently create closed shapes with shared boundaries in Inkscape, e.g. countries on a map? 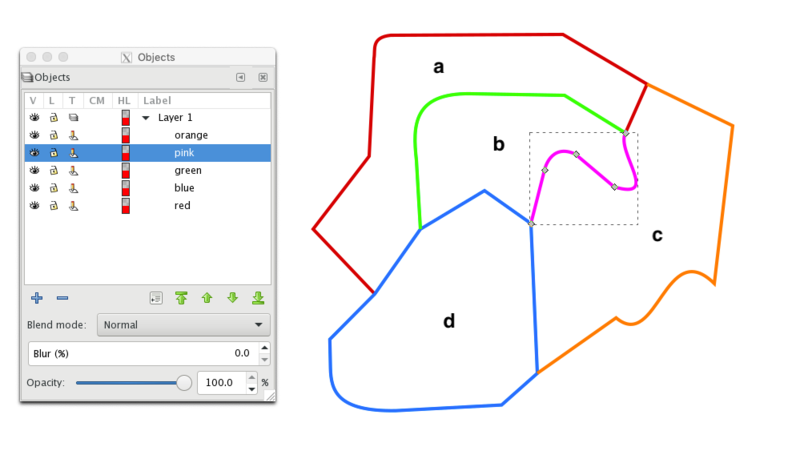 In the drawing you see five paths (orange pink green blue and red), which define the boundaries of 4 regions (a b c and d). I now want to create those regions so they are fillable, and without crazy "op-art" effects due to differing directions. For instance, to create region b, I need to use the pink path (which is shared with c), the green path (shared with a) and part of the blue path (shared with d). What is a process for doing this that is efficient? My actual drawing has dozens of regions and I'd like a process that doesn't take a week. If each shared border was one single path, with no gaps obviously, then it would be possible to use the technique described in the question I answered here. So, to do that, you would have to cut up some of the paths at the intersctions in your design first before doing that. Not the answer you're looking for? Browse other questions tagged inkscape path or ask your own question. How do I fill closed paths in Inkscape?